Everton caretaker manager David Unsworth said his team did him proud despite their Carabao Cup last-16 defeat by Chelsea. 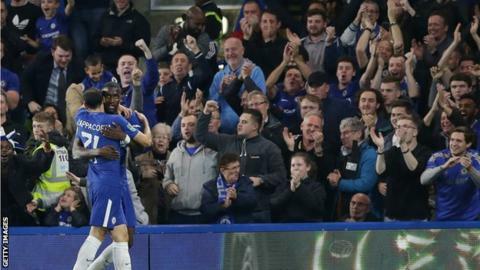 Willian scored the decisive second as Chelsea advanced to the quarter-finals but they were pushed to the final whistle by the rejuvenated visitors. Chelsea had contained Everton with ease in the first half and led through Antonio Rudiger's looping header. But the Toffees were sharper after the break as Kevin Mirallas had a shot well saved and Ademola Lookman hit the bar. "I'm a bad loser but I have to say I'm proud of the performance, they were terrific," Unsworth, who has replaced the sacked Ronald Koeman for now, told BBC Radio 5 live. "It was a committed performance. Hopefully we'll show that in every game I am in charge." Chelsea will learn their last-eight opponents when the draw is made at 16:00 BST on Thursday. Unsworth - taking charge of Everton in the wake of Koeman's sacking on Monday - will not have a last-eight tie to look forward to but was rightly delighted with his team's performance. A commanding defender during his playing days, he will not relish reviewing the opener however. With Michael Keane dropped to the bench and a flat back four on the pitch, neither Phil Jagielka nor Ashley Williams commanded the penalty box as Rudiger floated free to direct a fine header back across Jordan Pickford from Charly Musonda's cross. Unsworth has made no secret of his desire to be permanent Toffees manager and, after an insipid first half, his contagious passion for the club appeared to inspire a much-improved second-half showing. Everton's energy and industry flustered Rudiger, Andreas Christensen and Gary Cahill in the home defence and it took a string of smart saves from Willy Caballero to preserve their lead before Willian drilled in the hosts' second. A more mobile attack, with Tom Davies, Mirallas and Aaron Lennon all brought into the starting line-up, provided the Toffees with more direction and urgency and that may be the key lesson from the evening. With a Champions League campaign to fight alongside their Premier League title defence, this was the type of game to test a squad that Chelsea manager Antonio Conte feels is stretched too thin. However Danny Drinkwater, a £35m signing from Leicester, is some impressive back-up to call upon and the England international delivered a typically assured performance on his debut for the club. Michy Batshuayi could not take his chance to similarly press his claims for a first-team role. The Belgian was outmuscled by Jagielka after rounding Pickford in his only clear chance and saw Alvaro Morata, firmly Conte's first-choice striker, come on in his place before the end. The moment of quality that killed the game as a contest came from another Conte favourite as Willian hammered a low shot in off the inside of the post to double the lead. Calvert-Lewin bundled home a minute later, but it was destined to be in vain. Chelsea have reached the League Cup quarter-final for the 21st time in their history - only Arsenal (26), Spurs (23) and Liverpool (22) have achieved it on more occasions. Chelsea have not lost a home game against Everton in all competitions since November 1994 - remaining unbeaten in their last 28, winning 17, drawing 11. Everton have only kept one clean sheet in their last 14 games in all competitions (against Sunderland in the League Cup third round). Willian's goal was his first of the season for Chelsea, and ended a run of 14 games in all competitions without scoring (since May v Sunderland). Ethan Ampadu (17 years and 40 days old) became the first player born in 2000 to start for Chelsea in any competition. Chelsea scored with two of their three shots on target in this game, while Willian's goal was their only one of the second half. Chelsea travel to Bournemouth in Saturday's tea-time kick-off in the Premier League while Everton visit Leicester on Sunday. Match ends, Chelsea 2, Everton 1. Second Half ends, Chelsea 2, Everton 1. Goal! Chelsea 2, Everton 1. Dominic Calvert-Lewin (Everton) left footed shot from the centre of the box to the centre of the goal. Goal! Chelsea 2, Everton 0. Willian (Chelsea) right footed shot from the left side of the box to the bottom right corner. Assisted by Cesc Fàbregas following a corner. Corner, Chelsea. Conceded by Jonjoe Kenny. Attempt missed. Ademola Lookman (Everton) right footed shot from outside the box misses to the left. Assisted by Leighton Baines following a set piece situation. Attempt blocked. Davide Zappacosta (Chelsea) left footed shot from the right side of the box is blocked. Assisted by Álvaro Morata. Substitution, Chelsea. Álvaro Morata replaces Michy Batshuayi. Substitution, Everton. Oumar Niasse replaces Wayne Rooney. Ademola Lookman (Everton) hits the bar with a left footed shot from outside the box. Assisted by Kevin Mirallas. Attempt missed. Michy Batshuayi (Chelsea) left footed shot from a difficult angle and long range on the right is high and wide to the left. Assisted by Davide Zappacosta. Delay in match Michy Batshuayi (Chelsea) because of an injury. Corner, Chelsea. Conceded by Phil Jagielka. Attempt missed. Ademola Lookman (Everton) left footed shot from the left side of the box is close, but misses to the left. Assisted by Tom Davies with a through ball. Attempt blocked. Kevin Mirallas (Everton) right footed shot from outside the box is blocked. Assisted by Leighton Baines. Substitution, Everton. Ademola Lookman replaces Aaron Lennon. Attempt missed. Tom Davies (Everton) right footed shot from outside the box is too high. Assisted by Leighton Baines following a set piece situation. Substitution, Chelsea. Pedro replaces Charly Musonda. Attempt missed. Willian (Chelsea) right footed shot from the right side of the box misses to the right. Assisted by Michy Batshuayi. Attempt saved. Kevin Mirallas (Everton) right footed shot from the centre of the box is saved in the centre of the goal. Attempt saved. Phil Jagielka (Everton) header from a difficult angle on the left is saved in the bottom right corner. Assisted by Leighton Baines with a cross. Corner, Everton. Conceded by Antonio Rüdiger. Substitution, Everton. Dominic Calvert-Lewin replaces James McCarthy.